HONG KONG, Apr 16, 2019 - (Media OutReach) - Dorsett Hospitality International is proud to be the Exclusive Hotel Partner for Affordable Art Fair Hong Kong, London Battersea Autumn and Singapore 2019. As part of their ongoing commitment to support local talent through Dorsett Discoveries which promotes and supports Hong Kong talent on a global stage. Hong Kong grown local artist duo Stickyline and Hong Kong Arts Centre alum Meko Cheng will create a vibrant, Hong Kong-inspired programming at each art fair. 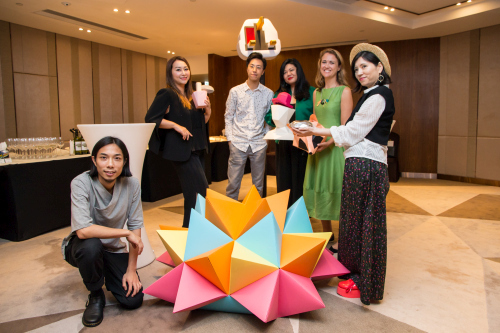 Following the fair, a part of the art installation will then be showcased at Dorsett Wanchai, Dorsett Shepherds Bush and Dorsett Singapore for the guests to enjoy. Dorsett Hospitality International's headquarters and 10 of its properties, across Dorsett Hotels, Silka and d.Collection, all call Hong Kong home -- much like their signature Dorsett bird. Flying far away from home every year, the Dorsett bird travels to see the world, staying in lively cities, meeting native birds and other travellers like her along the way. Using the passion for Hong Kong art and travel as their inspiration, Stickyline will be creating a large-scale art installation. For the last 8 years, Stickyline have continued to push the boundaries with their innovative three-dimensional paper engineering and designs -- creating everything from giant sculptures, stage-design, window displays and more for the likes of Lane Crawford, Audemars Piguet and Mercedes-Benz.